Katy Mixon at the CBS, Showtime and CW TCA Summer party in California. Katy Mixon at the TIFF Entertainment Weekly/Endeavor party. Katy Mixon at the CBS event "Cruze Into The Fall" in California. Katy Mixon at the 19th Annual "A Night At Sardi's" Fundraiser and Awards in California. Katy Mixon at the Variety's 2nd Annual Power Of Women Luncheon in California. Katy Mixon at the HBO's post Emmy Awards reception. Katy Mixon at the BAFTA LA's 2009 Primetime Emmy Awards TV tea party. Katy Mixon at the DPA pre-Emmy Gift Lounge. Katy Mixon at the world premiere of "All about Steve." Katy Mixon at the premiere of "All About Steve." Katy Mixon and director Phil Traill at the premiere of "All About Steve." Katy Mixon at the world premiere of "Four Christmases." Katy Mixon at the premiere of "Four Christmases." 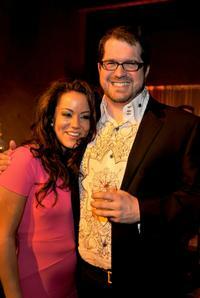 Katy Mixon and Director Seth Gordon at the after party of the premiere of "Four Christmases." Katy Mixon at the 36th Annual Annie Awards.